The typical porta potty may cost about $175 to $500 per unit for long term use such as a few weeks or more. Disasters happen all the time around the world. Disasters are often unexpected and can cost people their property, homes and even their lives. Whether man-made or created by mother nature, most communities in America have the ability to respond to disasters quickly and efficiently. Emergency management professionals and the first responders that we see out on the streets are working day and night to prepare for the next disaster. Their ultimate goal is to save lives and reduce suffering. When thinking about preparing for and recovering from a disaster most people tend to think about shelter planning as well as finding reliable sources of clean food and water. These things are certainly important however emergency management professionals have to think about sanitation services and temporary restrooms for disaster response and recovery. 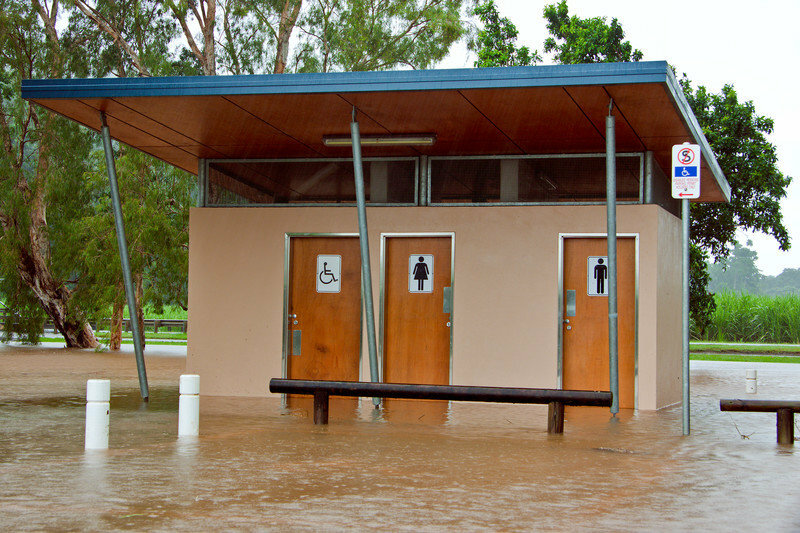 During a disaster like a flood or tornado access to restrooms can become limited. Disaster victims as well as the first responders and emergency professional who are helping with clean up and recovery will likely need access to restrooms. Portable toilets such as the standard porta potty are often the equipment of choice to help deal with this type of situation. In the absence of buildings and local restroom facilities a porta potty makes for a quick solution to a serious problem. Adequate sanitation and good hygiene is a key factor in ensuring that diseases aren’t spread during a disaster’s aftermath. Porta potties help to control this problem by preventing people from doing their business elsewhere which could contaminate the area and put workers or other disaster victims at risk. In addition to this, the porta potty makes it easy for families to stay together if they are at shelter. Finally, workers in the midst of the disaster area will have access to restrooms nearby which will enable them to more efficiently and effectively do their jobs. Porta potties make an ideal disaster response tool because they are inexpensive, mobile, easy to use, and require no utilities for use. In fact, most portable sanitation equipment rental companies have the ability to deliver their port-o-potties to remote locations or disaster zones within hours of getting a call. Costs for porta potties are also very low compared to large costs of the disaster and overall relief effort. The typical porta potty may cost about $175 to $500 per unit for long term use such as a few weeks or more. A typical rental agreement includes delivery, removal, and periodic cleaning/waste removal about once per week. Another great thing about porta potties is that that can be moved quickly and easily to conform to the needs of the disaster relief and cleanup effort. For the best and most accurate price for renting a porta potty it is recommended that you contact a portable sanitation equipment dealer in your area. Many companies, such as a VIP Rentals, are accustomed to helping with emergency response and disaster relief. Their experience and expertise in portable toilets can help you plan for recovery much faster. Furthermore, companies like VIP rentals, also offer free rental quotes and may even be able to negotiate a contract to provide emergency response services during the next disaster.